The Grapes of Wrath novel begins with the return of the Joads’ prodigal son. After four years of prison for manslaughter, Tom Joad is heading back to the farm where his family lives. On the way, he meets an ex-preacher named Jim Casy. Jim joins Tom on the journey home, only to find that his family has left — and that other farms in the area have been abandoned. After talking to a neighbor, Tom learns that the banks have taken the farms away from the families, who have headed west to find work in California. The neighbor tells Tom that his family has traveled to his Uncle John’s farm, and the next day Casy and Tom go there. He finds his parents packing everything they can take into a car, so they can head west and pick fruit in California. The Grapes of Wrath plot develops with the move west of the Joad family. They are traveling in a used truck that is in terrible shape, and they join a motley parade of junkers heading on Route 66 to California. Grampa Joad, who had not wanted to leave his land, dies fairly soon after the family takes off. The closer that the Joads get to California, the worse the news becomes. One of the rumors they hear is that 20,000 applicants are arriving in the state for every 800 jobs available — which means wages can be rock-bottom. The Grapes of Wrath story reaches its climax when the Joads get to California. Granma Joad passes away soon after the family reaches their destination. The family starts to split up, as the oldest son, Noah, leaves, and Rose of Sharon’s husband, Connie, leaves her (and her unborn child) behind. The migrants who are already in California are not friendly to any new competition for mostly nonexistent jobs. The major employers have figured out that the best way to maintain order among the workers is to keep them too poor to have time to organize, and so wages for a day cannot feed a family — even for a day. Camps called “Hoovervilles” (derisively named after President Hoover, who was in office when the Great Depression began) have sprung up all over California, and it is one of these that Jim Casy gets arrested for punching a sheriff agitated by Casy’s desire to start a union. Even finding a government-operated camp doesn’t help the Joads get a break. The local authorities want the camp to go away, so they set up a riot, but Tom gets wind of it and tells the camp leadership. However, Tom gets sucked into Jim Casy’s drive to organize workers, and when the police shoot Casy for organizing workers, Tom kills a policeman and has to flee. The Joad family quickly deteriorates from this point. The family has to live in a boxcar, which becomes dangerous when flooding rains hit that part of the state. Ma finds a barn for the family, and this is where the novel ends: Rose of Sharon, who had lost her baby but can still provide milk, nurses a starving man, but there is nowhere for the family to go once the rain ends. 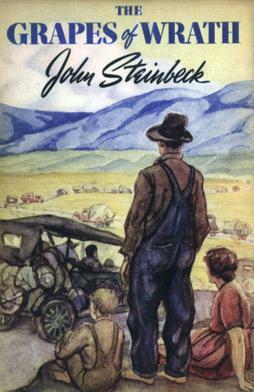 This is a series of study guides about John Steinbeck’s “The Grapes of Wrath,” the American novel about the effects of the Great Depression and the Dust Bowl on the poor of the American Southwest. The target audience is high school students encountering the novel for the first time.